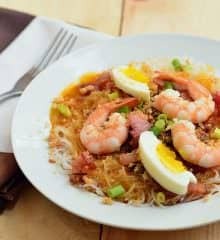 Pancit Palabok is a delicious Filipino noodle dish topped with shrimp gravy, shrimp, smoked fish flakes, pork cracklings, and eggs. Hearty and savory, it’s perfect as a light meal or anytime snack. 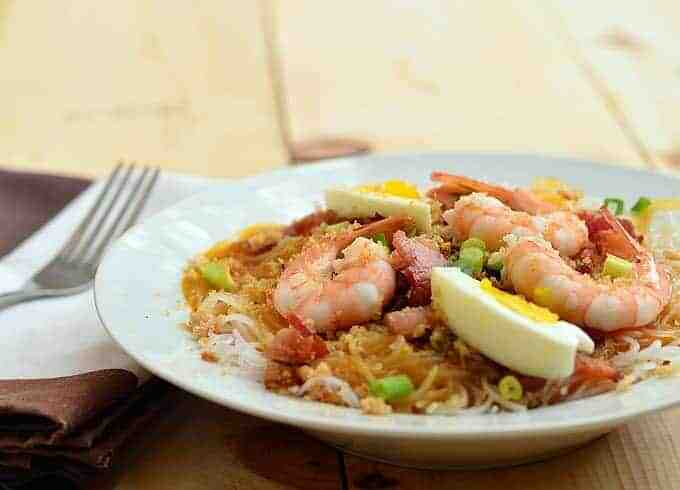 Pancit palabok is yet another example of Filipino’s affinity for noodle dishes. 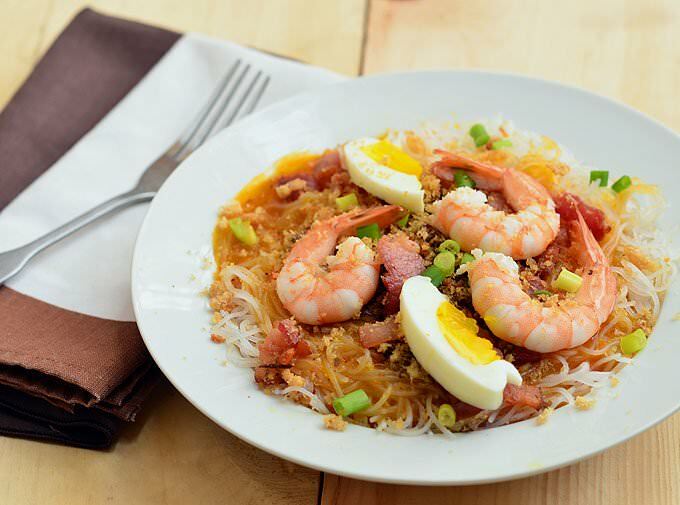 However, unlike the stir-fried bihon guisado or the broth-filled sotanghon soup, pancit palabok is smothered in a flavorful shrimp sauce and topped with a delectable mishmash of smoked fish flakes, crushed pork cracklings, crisp bacon, boiled shrimp, fried garlic bits, hard-boiled eggs, and green onions. The above are my preferred toppings but feel free to choose your own mix-ins. Steamed squid, mussels, fried tofu cubes, ground pork, crispy fried shallots and chopped lechon kawali are just some of the delicious ways you can kick things up. As you can see from the recipe below, making this noodle dish can be a very elaborate process what with the myriad of ingredients. I suggest preparing the toppings first as you will need the rendered fat from the bacon, the oil used in frying garlic, and the liquid used in cooking the shrimps to bring an extra depth of flavor to the sauce. It is customary to pre-mix the noodles, sauce, and toppings before serving the Pancit palabok for a party but although still flavorful, I find it a little less appetizing when it’s dried out and barely warm. The way I serve it for a crowd, I keep the palabok sauce continuously heated in a crockpot. 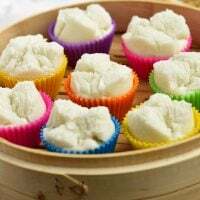 I set the various toppings individually in small serving containers and place the cooked rice noodles on a large platter with a chafing dish filled with hot water alongside it on the buffet table. 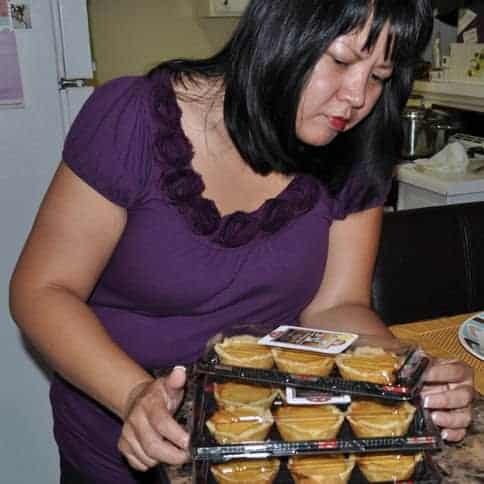 The guests can then use a noodle strainer (this is an affiliate link) to briefly dip (takes but a few seconds as they’re already cooked) the noodles in the hot water to reheat and pile on the shrimp sauce and toppings as they like. I have to admit, this method involves a bit more work and the queue can get really crazy around the buffet table but the guests do appreciate the novelty of pulling together their own plate of palabok. Not only is the pancit fresh and hot, bonus points for being able to pick their own choice of toppings! 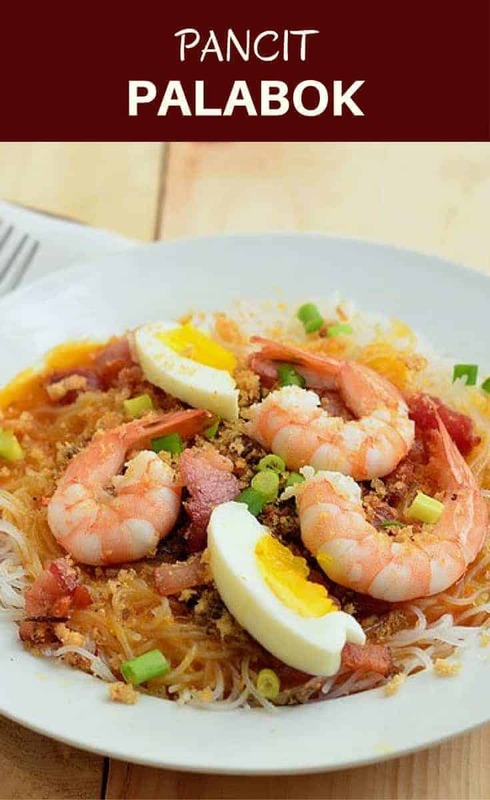 Pancit Palabok is a delicious Filipino noodle dish topped with shrimp gravy, shrimp, smoked fish flakes, pork cracklings, and eggs. Hearty and savory, it's perfect as a light meal or anytime snack. In a large bowl, soak rice noodles in water for about 2 to 3 minutes or just until softened. Drain well. In a pot over medium heat, bring about 6 cups water to a brisk boil. Add noodles and cook for about 1 minute. Drain well. Place noodles onto serving plates. Spoon sauce over noodles. Top with shrimp, chicharon, tinapa flakes, fried bacon, hardboiled eggs, toasted garlic bits and green onions. 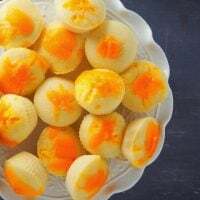 Serve with calamansi wedges. Peel shrimp, leaving tail intact. Reserve shrimp heads. In a saucepan over medium heat, bring 1 cup water to a boil. Add shrimp and cook for about 1 to 2 minutes or until color changes. With a slotted spoon, remove shrimp from and set aside. Reserve liquid. In a pan over medium heat, add 1 tablespoon oil. Add tinapa flakes and cook, stirring regularly, for about 1 to 2 minutes or until lightly browned and heated through. Remove from pan and set aside. In a skillet over medium heat, add chopped bacon and cook, stirring occasionally, until golden and crisp. Remove from pan and drain on paper towels. Reserve 2 tablespoons of bacon grease. In a small pan over low heat, heat about 1/4 cup oil. Add garlic and cook until lightly browned and crisp. With a slotted spoon, remove toasted garlic and drain on paper towels. Reserve garlic oil. With a knife, coarsely chop reserved shrimp heads. In a pot over medium heat, combine shrimp heads and 4 cups water. Bring to a boil, skimming any foam that rises to top. Lower heat and simmer for about 10 minutes to extract flavor. Using a fine mesh strainer, strain liquid and discard shrimp solids. In a bowl, combine shrimp stock (about 4 cups from the shrimp heads and 1 cup reserved from boiling shrimps), reserved garlic oil, shrimp bouillon, and annatto water. Stir well until annatto powder and shrimp bouillon are dissolved and water has changed to orange color. In a sauce pot over medium heat, add reserved bacon grease. Add flour and cook, stirring constantly, for about 2 to 3 minutes or until golden. Whisking vigorously, slowly add shrimp stock mixture. Bring to a boil and then lower heat to a simmer. Cook, regularly, for about 5 to 8 minutes or until thickened. Season with salt and pepper to taste. You can also add fried tofu cubes if you like or just add more chicharon or the other choice of toppings 🙂 Did you want to omit the shrimp flavor/broth from the sauce as well? 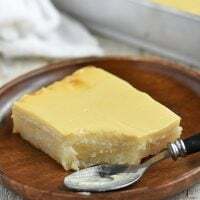 Looks yummy, try ko lutuin.Thank you for recipe. 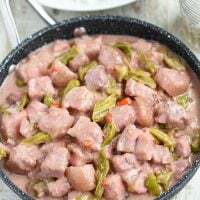 I think I will try this plus the suggestion to just add more Chicharon. We also do not have any chicharon or if ever mahirap hanapin. Thank you. wala kasi kaming tinapa flakes ditto sa Belgium. any smoked fish that tastes close to tinapa.